NOTE: This State Template version is now considered a legacy version with limited support. See the latest State Template. View a demo version of the Legacy State Template v4 with working sample pages and instructional documentation. 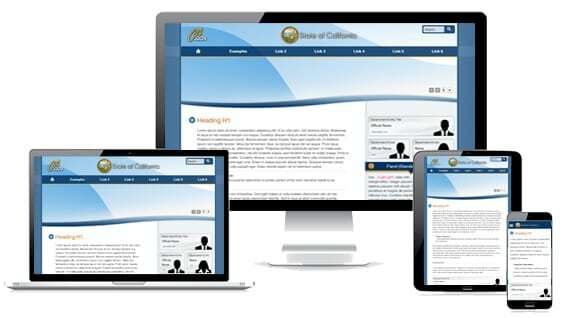 *The sample footer is specific to the California Department of Technology. Please ensure that your footer links are specific to your organization. Version 4.6 has been added to eliminate some redundant color scheme classes and make the mobile navigation more consistent. In the previous versions, the background image used for the hero banner was hidden from the mobile view causing the organizational logo on desktop header to not have enough contrast on the darker mobile menu background. A version update has been developed to fix several several issues including the Google Custom Search implementation. Some visual improvements have also been made as well as page layout that spans the full width of the display. Siri, Google Now, Cortana, etc. Because of standardized architecture and semantic markup, future migrations are significantly simplified! Additionally, technologies such as LESS were introduced and new content modules also added for State agencies and departments to utilize when developing their websites.